Definition: The Investment Decision relates to the decision made by the investors or the top level management with respect to the amount of funds to be deployed in the investment opportunities. 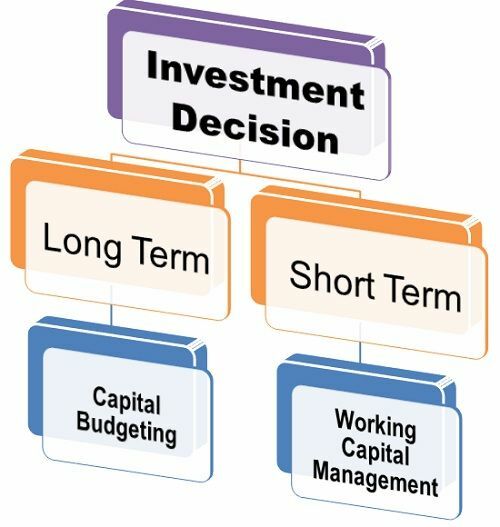 The decision of investing funds in the long term assets is known as Capital Budgeting. Thus, Capital Budgeting is the process of selecting the asset or an investment proposal that will yield returns over a long period. The first step involved in Capital Budgeting is to select the asset, whether existing or new on the basis of benefits that will be derived from it in the future. The next step is to analyze the proposal’s uncertainty and risk involved in it. Since the benefits are to be accrued in the future, the uncertainty is high with respect to its returns. Finally, the minimum rate of return is to be set against which the performance of the long-term project can be evaluated. The investment made in the current assets or short term assets is termed as Working Capital Management. The working capital management deals with the management of current assets that are highly liquid in nature. The investment decision in short-term assets is crucial for an organization as a short term survival is necessary for the long-term success. Through working capital management, a firm tries to maintain a trade-off between the profitability and the liquidity. Thus, a firm must have an optimum working capital that is necessary for the smooth functioning of its day to day operations. Very nice article you prepared regarding investment. This article really helps my understanding of working capital management and capital budgeting. In simple words, easy to understand! !